Skylar Rushton and Jayme Krane aren’t your typical University students. The pair has dedicated the last two years of their university careers to fighting childhood cancer. They helped co-found Laurier Against Childhood Cancer (LACC), a recent club added to Wilfrid Laurier University’s campus that is devoted to promoting the issue of childhood cancer and fundraising. 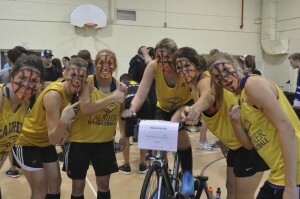 An indoor cycling event, The Inside Ride, is a popular fundraising function that started in 2007. In the last six years, it has raised over five million dollars and has done over 500 events across Canada. One hundred per cent of the profits go towards an external foundation called Coast to Coast Against Cancer. The money is then used to take care of financial costs for families and help pays for treatment, hospital beds and of course sponsor research. In fact, the founder of Coast to Coast is actually Jeff Rushton — Skylar’s father. “That’s how I got involved,” Skylar explained. Krane found her place at LACC when she was put into contact with Rushton in her first year. “It just so happened that we were in the same year, same program, and same business lab,” Krane laughed. From there, the two decided to create an on-campus organization that hosted the Inside Ride. “[Cancer] is actually the leading non-accidental cause of death in children under 18 and it’s also the most underfunded research in Canada,” Rushton said. “Usually a lot of children who have treatments so early get other side effects later in life,” Krane added. However, Rushton and Krane explained that they are organizing the Inside Ride to both raise funds and to bring more spirit and enthusiasm to Laurier’s student body. “It’s a lot of the same enthusiasm as Shinerama,” Krane compared. The Inside Ride event is scheduled to run Saturday, March 9 at University Stadium. The event usually runs about two and a half hours and requires teams of six to bike ten-minute intervals while the others “dance” around the rider. Krane also explained that LACC is hoping their event will inspire clubs, teams, and residences to participate. However, apart from the fundraised money, Krane and Rushton explain that the best parts of Inside Ride are the energy and feedback. Optimistic, Rusthon emphasizes that the event is supposed to be empowering, exciting, and energizing.